Traditional and imaginative drawings of the dog next door by Douglas Rickard. 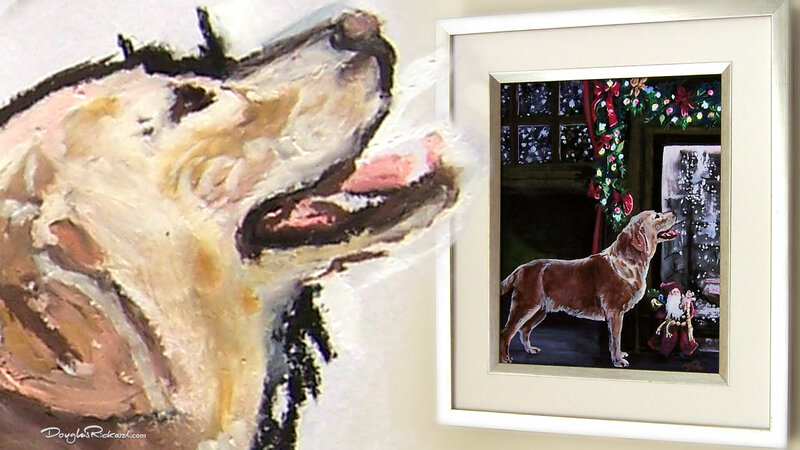 This oil pastel drawing of an eager Golden Retriever has been added to a Holiday fireplace just in time for Christmas Eve. Available in three Numbered Limited Editions of 35, these art prints show just how much of a tail wagging Santa is about to get this year. The beautiful backdrop of Yellowstone National Park is the setting for this German Shepherd fantasy. 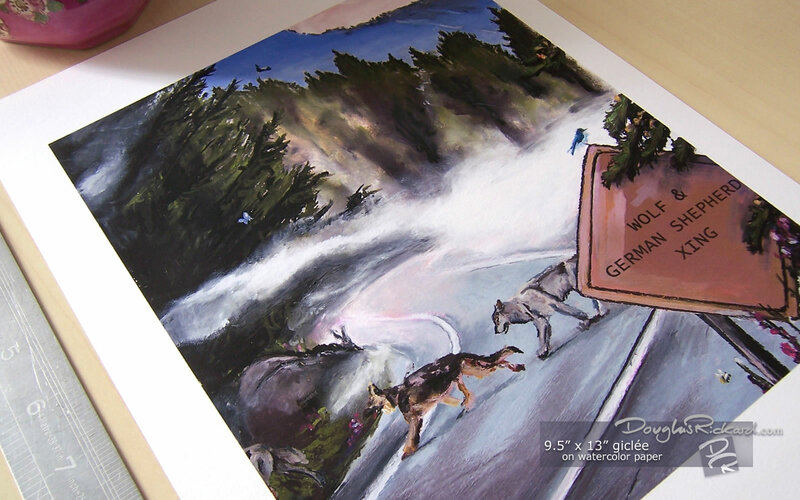 This early morning ramble with wolves is ready to come home as personalized art with the name of your German Shepherd! 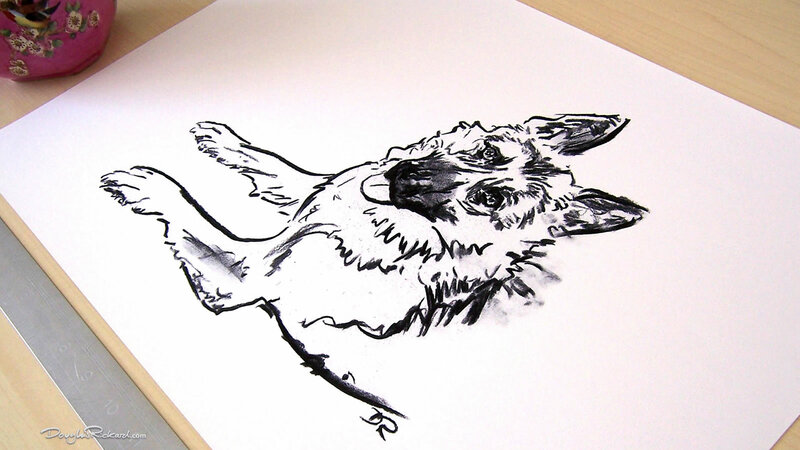 I wanted to capture the straightforward, special bond between German Shepherds and their owners in this uncomplicated line drawing. If you’re a dog owner you may know how they can turn your world on and certainly bring a smile. Today I’m taking you back to 1970 downtown Minneapolis and the opening song from “The Mary Tyler Moore Show,” in this “making of” video about the creation of my retro Golden Retriever drawing. Whereas I remember more late-night “Rhoda” reruns; and even got to be in the studio audience for the filming of an episode of “The Hogan Family,” (with Sandy Duncan and not Valerie Harper, that is); I still wanted to re-imagine this iconic Mary Tyler Moore moment … with a dog. What’s a Boston Terrier to get for Christmas? Take a look at Holiday decorations being drawn around the fireplace in this “making of” video about the home of a Boston Terrier one snowy Christmas Eve. My “It Sparkles” art exhibit was just the ticket for us in North London back in the summer! 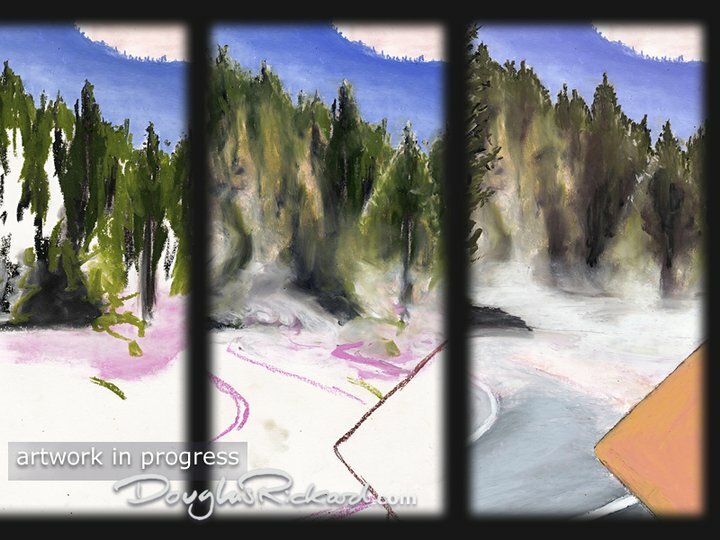 Here’s my video report of how, I felt, the art prints of my pink dog drawings and landscapes permeated with heightened color really did let the ‘light’ in. Just imagine how well this art does its job throughout the winter!